This lightweight behind the head headset places pressure on the temple and hangs over the ears, allowing for all day comfort without feeling pressure on top of your head. The BOOM microphone and the ear piece attached to the left side of the mounting wire allows for comfortable, quiet and discrete communications. 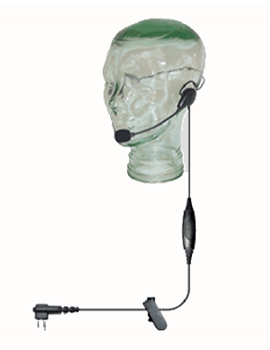 The behind the head headset also includes an in line PTT button which allows the user to easily communicate without having to reach for the Portable radio’s PTT button. The behind the head headset is useful when coordinating a play, galas while using a clip board, or when having an earpiece in your ear is not comfortable for you.